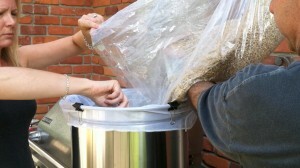 Brew-In-A-Bag is Easy All Grain Homebrewing! Are you ready to take your homebrewing hobby to the next level? Is all-grain brewing something that interests you, but you just think it may be too much of a hassle? Then you really should consider the Brew-In-A-Bag (BIAB for short) method of all-grain brewing. BIAB is a great way to brew and depending on your batch size, you probably have most of the equipment already. Hey, We’re in Brew Your Own Magazine! 1. Extract Brewing – Using malt extract to create your wort. This is how we all started! 2. Extract Brewing with Specialty Grains – Crushed grains are steeped in water using a grain bag. It’s a lot like making tea. Then, the bag of spent grains are removed and the preliminary wort that is left is where you add the malt extract and additional water required to make the brew volume needed. 3. Brew-in-a-Bag (BIAB) – This method is basically like steeping specialty grains, but on a larger scale. You also do not add malt extract to make your wort. You use the same grain bill that a traditional all-grain brewer would use, but you add the full volume of water that will be required for the entire brew process right up front. If you plan on making a typical 5 gallon batch, then you’ll need a pretty large kettle. That’s why BIAB is a popular Small Batch Brewing method (1-3 gallons). You have to take into account that water lost from grain and hop absorption, boil-off, and the trub in the fermenter. After mashing is complete, when you remove your grain bag, what’s left is the volume of wort that you will then boil. There is no need to add any additional water as you would have in extract brewing. Simply follow your recipe as before to complete the process. 4. Conventional All-Grain Brewing – Don’t be mistaken – BIAB is really all-grain brewing, but not in the traditional sense. Although there are various ways to brew all-grain (like partial mash and different sparging methods), they require more equipment than any other method. To mash your grains you’ll need a mash/lauter tun (picnic coolers are popular for this) and a large sparge water pot to heat your mash and sparge water. You’ll then need a brew kettle that will hold about 6 gallons of wort while boiling, so probably need about an 8 gallon kettle to avoid boil-over. So if you haven’t figured it out yet, this site is all about home brewing using the brew-in-a-bag method, originally developed in Australia. I’m not claiming to be an expert, but I wanted to share what I was learning, so I decided to keep a video log of my brew sessions and share them here. Hopefully you pick something up here that’s useful and learn from my mistakes!